You signed on your new home, and congratulations are in order! After the ink dries and your paperwork, your brain immediately begins to focus on best part of buying a new home – moving in! It is so exciting to imagine your things in fresh, new spaces that you simply cannot wait to start boxing everything up so you can unpack your new life as soon as possible. Though moving is often considered to be one of the most stressful endeavors in life, there is no reason that your move should be a black spot on your year. Yes, there will always be a certain level of stress that goes into every move, from worrying about moving costs to biting your nails as you watch movers load your delicate wedding china into the truck. However, if you consider the elements of your move early on, you will see that moving is an opportunity to get off on the right (organized) foot in your new house. Whether this is your first move or your fifth, there are a lot of nuances that go into making your move to a new house a success. Thankfully, a little planning, a lot of organizing, and a few helpful tips and tricks can go a long way to helping your master your move and settle into your new house quickly. Giving your move a constricted timetable between moving out of your old home and moving into your new one is a recipe for stress. Not only does it mean that you’ll have to stay on an extremely tight schedule to pack, clean, and unload your boxes into your new home, but it also means that you’ll likely miss or rush a lot of critical steps in the moving process that can come back to bite you later. Yes, a fast move can be done if you are ready, willing, and able to hyper-organize your move quickly and effectively. It is recommended that you allow yourself one month to move in and out of your homes, which is perfect when you consider that the average move-in time after closing is around 35 days. Trick: Pick a reasonable “MUST MOVE OUT/IN BY” date and make your plans around it. Before you put a single item into a moving box, you first need to get yourself a calendar so that you can schedule your move in advance. Whether you choose to make an online calendar, use a personal planner, or mark everything on your home’s wall calendar, you absolutely need to orchestrate every element of your move with your regular daily schedule. Trick: Color-coding your moving to-dos by the person responsible for the task will make sure that everyone in your family is on board with the moving schedule and knows what is expected of them. Children and teens will also be more likely to help with the move if they know exactly what they need to do beforehand. 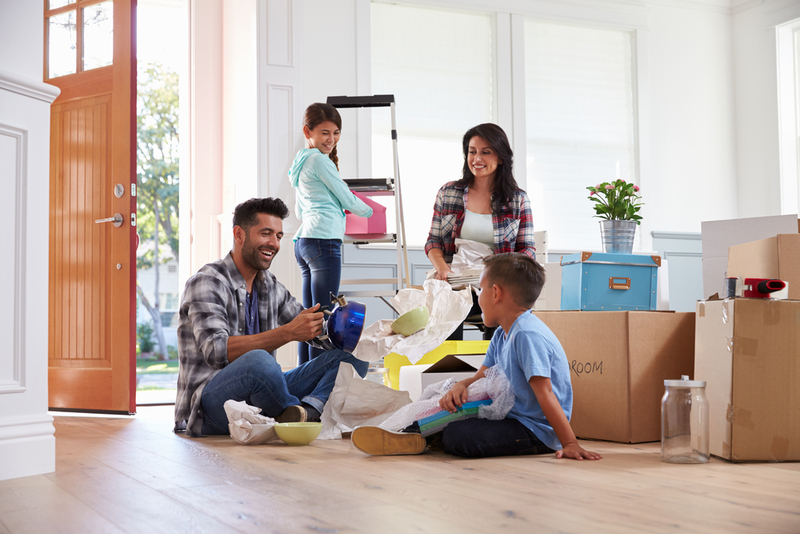 Before you begin bringing your things into the new home, cluttering up the space with boxes and obstacles, make preparing your new home a number one priority. Take a tour of the new house with a notepad, pen, and camera ready, and make a list of everything that you would like to revamp, repair, or change in the home before you bring any of your items over. With a list in hand, set aside a day or weekend to paint unsightly walls, replace cracked tiles, or add a light to a bedroom. These types of small changes are so much easier to do when the house is empty, and you will be thankful that you did them beforehand when you move your family into your new fixed space. Trick: If you paint any walls, mark the top of the can with masking tape and write the name of the room on it for easy touch-ups down the line. Yes, those collectible beer steins you got on your trip to Germany are a great reminder of your favorite vacation, but if you don’t use them daily, they should not be packed in a box with your use-every-single-day drinking glasses. Designate two types of boxes for each room of your house – one that you pack everything in (in an organized fashion), and one that you fill with the items in that room that you will likely need on a daily basis. For example, your home office is probably filled with lots and lots of paperwork, accordion folders, filing cabinets, pictures, and computer items. Instead of balling all of those things into one box, keep your quick-access items, like the files for your new home sale, move out paperwork, and important family documents and records in a designated box that will not be lumped in with the others. When it comes time to pack up that moving truck, all of these quick access boxes need to go in last so that they can be unpacked first before you bring any other boxes into the home. It may seem like a chore, but it is the easiest way to not waste twenty minutes of your busy morning digging through boxes for spoons and bowls so your kids can eat breakfast before school. Trick: Label your boxes with as much detail as possible. Every single box should have an easy to read the list of what’s inside of it so you don’t have to dig through them all to find one item. Once you have begun boxing up your things to move, your clean house will suddenly seem incredibly dirty. This is a time when you deserve to hire a cleaning crew to move you out of your home. Trick: Plan something relaxing for your family while your home is being move-out cleaned. You deserve it.